Jack just wanted to have a caving holiday on Mount Shasta. Caught in a terrible storm as he enters the area, he stops to assist a broken-down car. Moments later, a third car crashes into the back of his, wrecking all three vehicles. With no means to go find help, the vehicles’ occupants reluctantly band together to seek shelter from the storm in a nearby abandoned cabin. But this is a cabin with an ill-starred history, and dark forces are abroad in the woods. With dawn a long nine hours away, will any of the stranded motorists live to see the sun rise? Really enjoyed this game. 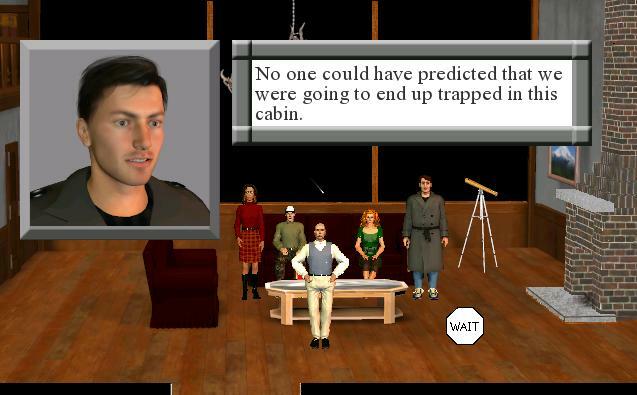 The puzzles were pretty straight forward, but the author created a really enjoyable take on the "haunted cabin in the woods" type scenario. Huge amount of work went into the backgrounds. After seeing the reaction from other players, I decided to give this game a try. I am very into horror games. This game has a few redeeming qualities, but after the eighth jump-scare in the frame of a minute, the novelty wears off. The poor graphics, story and grammar problems really hinder the immersion. The puzzles are instantly solvable and not creative. Play this is you need to burn an hour. I found this game fairly bone-chilling. There are some great horror effects thrown into this (I also jumped out of my skin like stepurhan). A thoroughly engrossing ane well thought out game. I especially liked the way the puzzles were integrated with the plot, so your actions felt natural rather than puzzle-solving. Not for the faint-hearted though. I near jumped out of my skin when entering the downstairs hallway in chapter 3. Good use of overt scares (like that particular jump-scare) sparingly rather than relying on them. This was an interesting game. I just couldn't get into the game during the first two scenes, but later the game managed to pull me in. I didn't like the art and the action parts are pretty weak. The characters have potential, each with his or her own personality, but the writing is rushed. The 'strangers crashing in a haunted house' concept has been tried and tested, yet this game manages to pull it off in a refreshing, original fashion. It's very well written, the story is set up well and the characters are fleshed out more than you'd expect. The game stays compelling and entertaining by means of clever character switches and a nicely paced eerie atmosphere. The action sequence mentioned above didn't work for me, but you're allowed to skip it, so I didn't lose myself in frustration there. It's also pretty cool that some of your actions affect the ending! This is like a well mixed drink with ingredients like some drops of scare, a splash of romance, mixed with mystery, a spoon full of tension and some pinches of death. You are allowed to dive into the story as deep as you like, discover all the innumerable details to explore the motivations of the characters and enjoy the atmosphere. Even if you are not that kind of gamer and prefer solving your task, you will get in the right mood while going through the story. You also get a chase, which you are allowed to try as long as you have fun with it (or successfully go through). I enjoyed this game and the different ending were interesting.